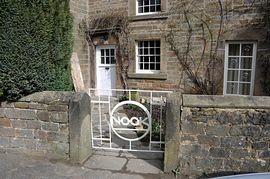 The Nook is a stone built cottage in the heart of the Chatsworth estate village of Beeley, away from the main road near to the church. The whole cottage was renovated in 2010 and all the contents are new. 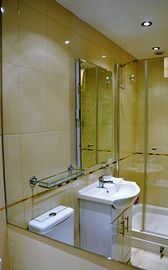 A total refurbishment of the cottage was undertaken in 2010. You will be able to enjoy the comforts of under-floor heating on the ground floor complemented by oak and tile floors. Other facilities include a new kitchen, a dining room and a separate lounge with a large flat screen TV with HDD FREESAT recorder. 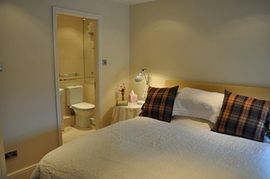 There are three upstairs en-suite double bedrooms and a downstairs cloakroom. 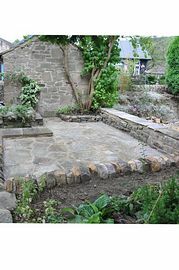 There is an open terrace for sitting out, and, off-street parking for two medium sized cars and on-street parking outside the cottage. ofcourse Chatsworth House is but a stones throw away. This is a truly deluxe hideaway for close friends or family. If you are looking for the best and want to spoil yourselves then look at our own website. 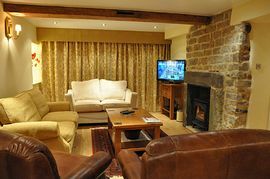 3bed-3bath, shower cottage in the Peak District. From the M1 take the turn off for Chesterfield J29 and follow signs for Matlock and or Bakewell. The Beeley village is about equal distance between Matlock & Bakewell. All other directions follow signs for those two towns. See map. Approximately from: £500-£900 per week. Changeover on a Saturday in high season - other times flexible.